Below is the schedule of events for the first day of the 2010 Anti-Death Penalty Alternative Spring Break, Monday, March 15. You may come to all the events or just individual sessions. Everyone is welcome. You do not need to register, just show up for the events. It is all free. 7:00- 8:30 PM Panel discussion with death row exonerees Shujaa Graham (3 years on California death row), Perry Cobb (8 years on Illinois death row), Derrick Jamison (17 years on death row in Ohio), plus family members of people on death row, Delia Perez Meyer, Terri Been and Crystal Halprin. Delia’s brother Louis Perez is on Texas Death Row. 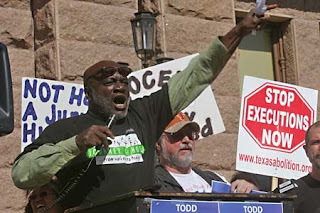 Terri’s brother Jeff Wood is on Texas Death Row. Crystal’s husband Randy Halprin is on Texas Death Row. The Law of Parties will be one topic covered by Terri and Crystal. Evening Time on your own for enjoying Austin, including the SXSW film festival. Join us March 15-19, 2010 in Austin, Texas for the award-winning Anti-Death Penalty Alternative Spring Break. It starts at 4:30 PM on Monday, March 15. The location is the Jesse H. Jones Communication Center – CMA room 3.112 on the campus of The University of Texas at Austin. CMA is on the corner of Whitis Avenue and Dean Keeton, (Google Map). The room is located on the entrance level of the building.